My sister gave me such a great Christmas present. She signed me up for the Unity Stamp Company Stamp of the Week Club. So, it has been like Christmas every week since the first week of December. I love opening up my package for a surprise. The deal was that if she was to do this that I couldn't sneak on to the site to see what the stamp of the week was going to be. I think that's fair. This little guy is so sweet and the sentiment can be used over and over again. 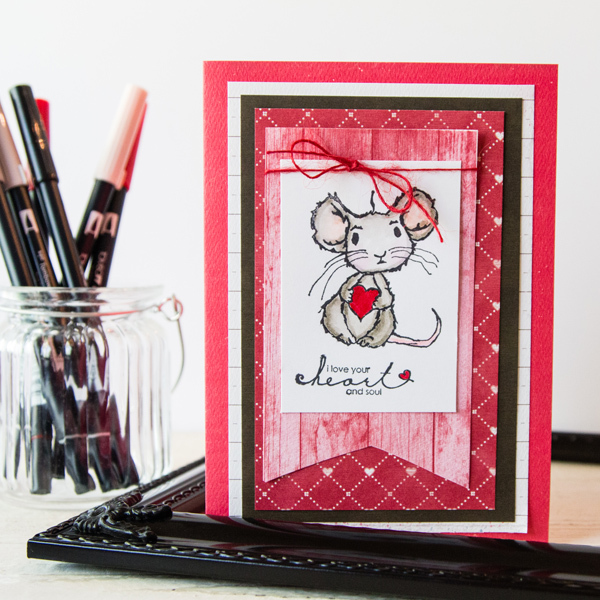 I chose to use the exclusive Authentique Two Valentines 12x12 paper pad! Really, there are so many universal patterns in this pack that I could use for so many other projects other than a holiday! I can't wait to show you some more of the stamps I have added to my collection these last few months! Create Well: Good surprises can come in small packages.